It all started when I received a Teresa Collins Adhesive Kit from Xyron. The box is wonderful. It has a magnetic closure and it was perfect for being altered. It’s perfect for keeping my Teresa Collins supplies in but it’s also great for packing with some nice chocolates and small gifts to give away. I didn’t want to cover the entire box because I liked the pretty pink surface so opted just to alter the top. I started with a pulled-paper technique by running my inked background paper through my Xyron 9-inch Creative Station. I peeled it from its backing and stuck it down to the box cover, rubbed it down really well then found a loose edge or two and ripped off quite a bit of the paper. 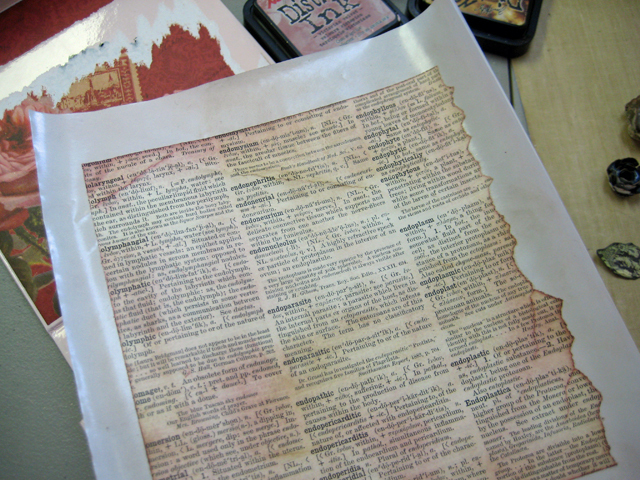 This leaves a thin layer of the paper behind in some areas – really a cool look! 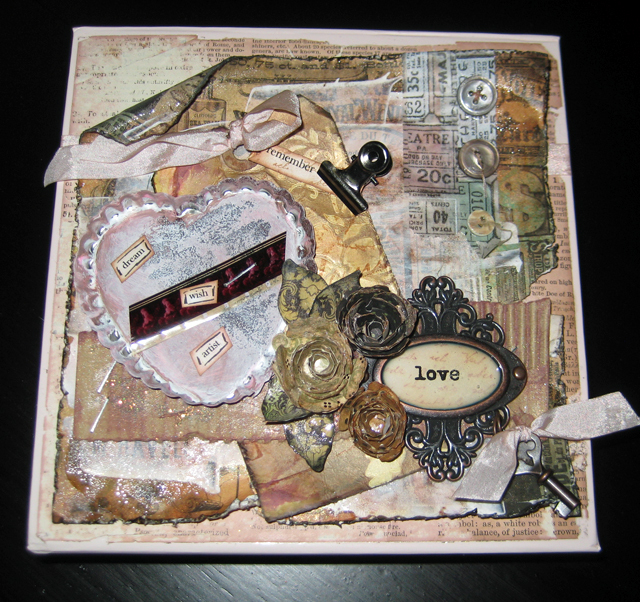 This creates a nice base to build layers on and started by adding a length of pink krinkle ribbon with the Teresa Collins Tape Runner. This ribbon wraps around the lid and ties on the inside. 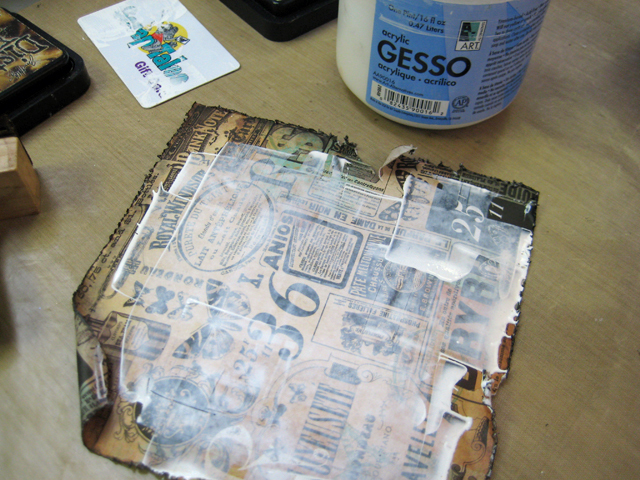 After cutting, distressing and inking another pattern paper I coated it with a thin skim of white Gesso and let it dry. 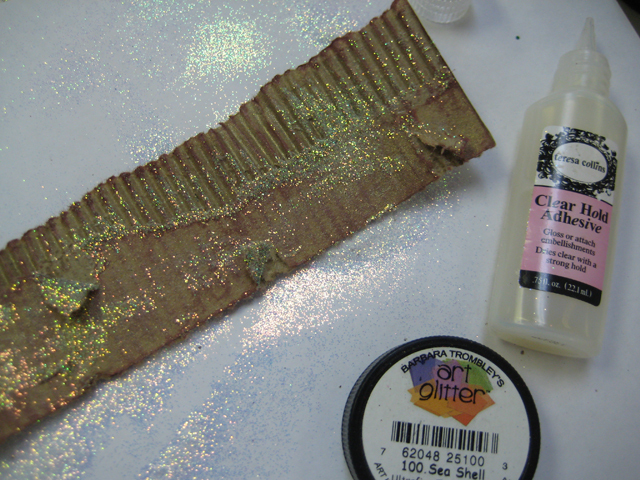 While the backing was drying I spread some Teresa Collins Clear Hold Adhesive randomly across a strip of corrugated cardboard using my finger and lightly sprinkled with some Sea Shell Art Glitter. I stapled this strip to the dry backing using the Teresa Collins Stapler. I love this stapler! It goes through really thick stuff! 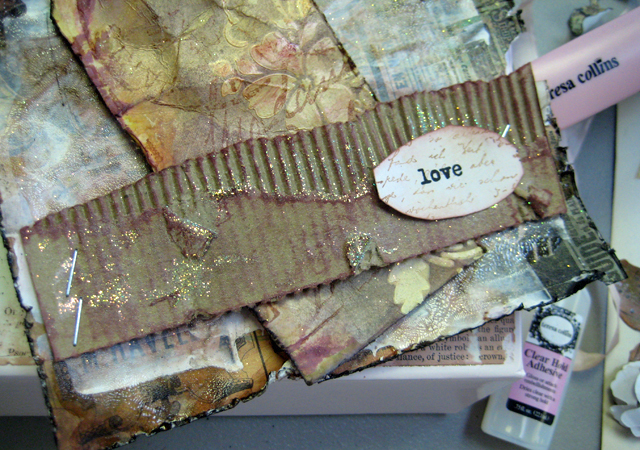 I was able to tuck a decorated tag into the strip and glued a title on that will go behind a Tim Holtz metal bookplate. 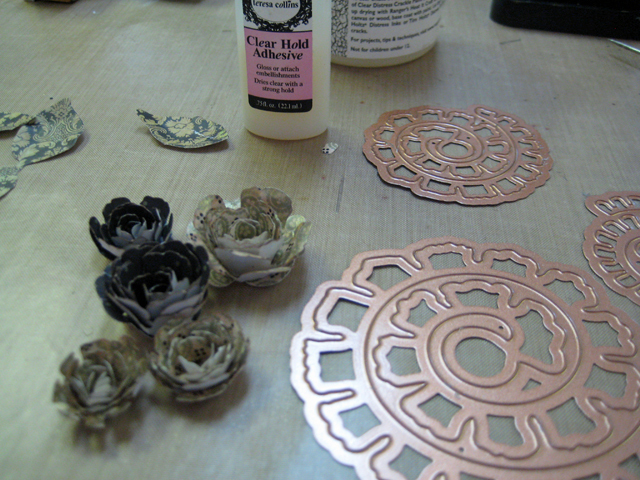 I made several different sizes of paper flowers using a Spellbinder’s Donna Salazar die, glued them together with the Teresa Collins Clear Hold Adhesive, inked them then spread a thick glob of Tim Holtz Clear Crackle Paint on them and left them to dry. Let the assembly begin! I just played around with lots of stuff out of the table and continued to layer items till I got the look I really liked. 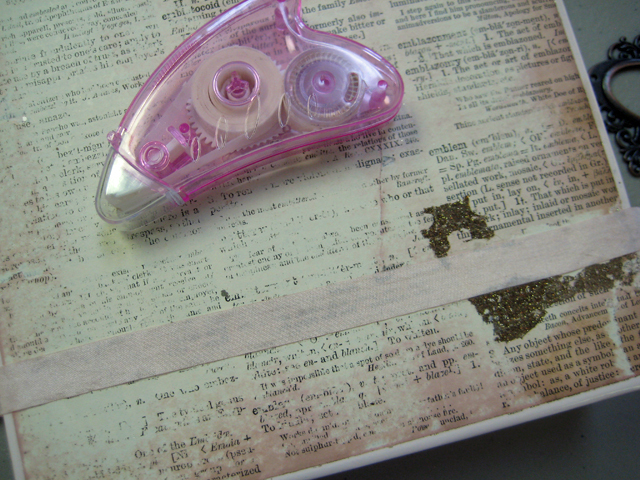 The filmstrip is stapled through the tin heart with the Teresa Collins Stapler. Once the backing was completely assembled it’s glued on the cover with Teresa Collins Clear Hold Adhesive; the same adhesive is used to fill the bookplate. It dries clear and dimensional. I added a bit more detail to the cover with some tissue tape and tied a pretty ribbon through a key and attached it with jump rings. It’s now ready to be packed up presented as a very special gift. Gorgeous transformation, Linda! Love how you filled that bookplate, too… a super touch! Thank you, Marjie. Been loving your journal pages, too! You are amazing with color. One day I’ll break out of my dark and earthy mode! Linda you are always AMAZING!! Thank you so much, Jan! Hope to see you soon! Beautiful! You always make it look so easy. Thank you, Karen. It really is not difficult. I teach classes here in the studio regularly. Anyone can do this! Thank you, Jane! 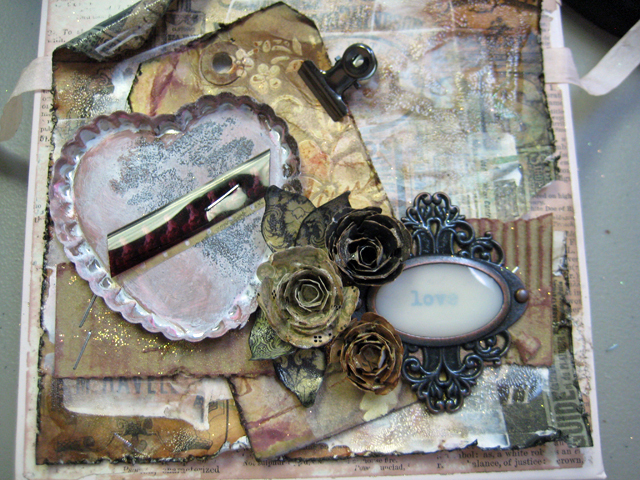 I love to add lots and lots of layers.